A candle lit room can feel so cozy in a winter storm. 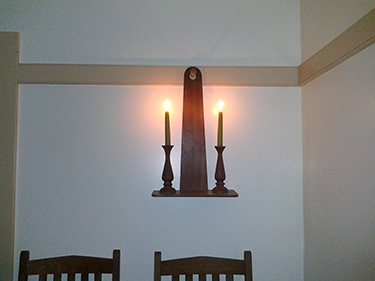 We have sconces along with the pair of candle stick holders and beeswax candles as a package. Everyone who enjoys the outdoors and needs to wear boots needs one of these! 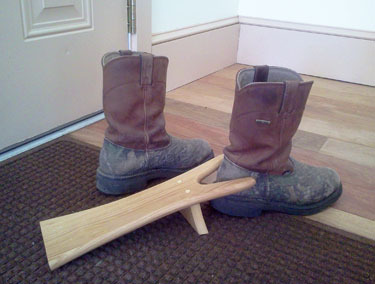 They make quick and easy work of removing your boots. Sturdy White Ash construction and artistic design. Some have said they are too beautiful to use, but go ahead, That’s what they’re for! 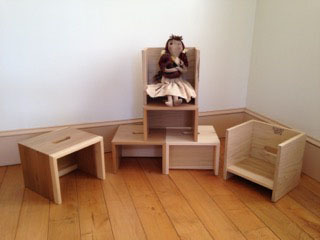 Here is a very useful designed step stool/booster seat combination that we came up with when our children were small. 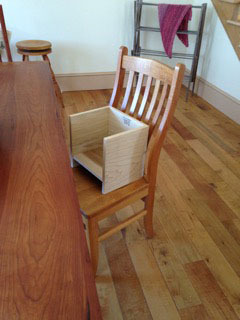 The step stool doubles as a booster seat at the table, is robustly designed and should give many years of service. Made of beautiful Tulip Poplar wood and finished in a clear non-toxic durable top coat finish, it will find an indispensable place in your home. We have two sizes to choose from. Having a limited supply of these fine booster seats in stock, we are offering a standard shipping price to get them to your door before Christmas. Each price inludes a sturdy cardboard box with padding and insured shipping to your door. Hurry! Stock is very limited, so if you want one, order it soon!